We believe families considering adoption need to hear the stories of how other adoptive parents found TRUTH along the journey. We believe families who have just brought a new member into their family need TRUTH to set the foundation for their new reality. We know being an adoptive parent is not always easy, and struggling parents need a lifeline of TRUTH to hold on to. Of course, when we discover that truth, sharing it with others gives our stories meaning and purpose. WHAT WILL THE BOOK WILL LOOK LIKE? 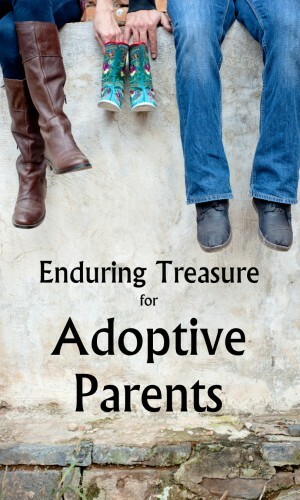 Each chapter in the 30 day devotional book will include a passage from the Bible, a treasure from God’s Word for each day that has helped an adoptive parent along their adoption journey. Following the passage of Scripture, we’ll briefly tell the story of how that treasure was a blessing in a unique situation to a real family. The final element in each chapter is a responsive prayer. Pray about this project, for God’s hand to be upon it, for Him to RUN it from beginning to the end and that He will bring glory only to Himself through it. Pray for each story to be guided by the Holy Spirit for the greatest impact. Write a chapter. If you’re an adoptive parent, think about the treasure from God’s Word that He has used in your life and the story surrounding that experience, then write it down. You don’t have to be a writer! ALL the information will be edited so that it fits together in one cohesive resource so don’t worry about the wording. Just record your verse(s) and a brief story of why it was precious to you in 500 words or less View a Sample Chapter Here . We don’t have to include your name. (There will be a statement in the book saying something like, “Some names have been changed in this book to protect the privacy of the individuals involved.”) If you request it, the edited version of your story can be approved by you before we publish the final version of the book. Then, if you don’t like what we’ve done with your story, we don’t have to include it. If you are interested please Contact Us. Share in the expense of providing this resource for those who need it. There are costs attached to the coordination of this project. Enduring Treasure Ministries is stepping out in faith as the project has been initiated. Your financial partnership is vital for this project (and other important projects like it) to be a reality. If you would like to contribute financially, please mail a check with “Adoptive Parents Book” in the memo line, or through PayPal on our website and note the designation. Share this information with others who you think might like to participate. We’re just looking for solid Christians who have had some sort of experience bringing a child into their family – adoption (international or domestic), foster, grandparents raising their kids’ kids, etc. HOW CAN I LEARN MORE ABOUT ENDURING TREASURE MINISTRIES?